European Court Upholds France's Burqa Ban : The Two-Way The European Court of Human Rights ruled that France's ban on face-covering veils was legitimate, and did not violate a Muslim woman's freedoms. A woman wearing a niqab eats on the Promenade des Anglais in Nice, France, on June 26, 2012. 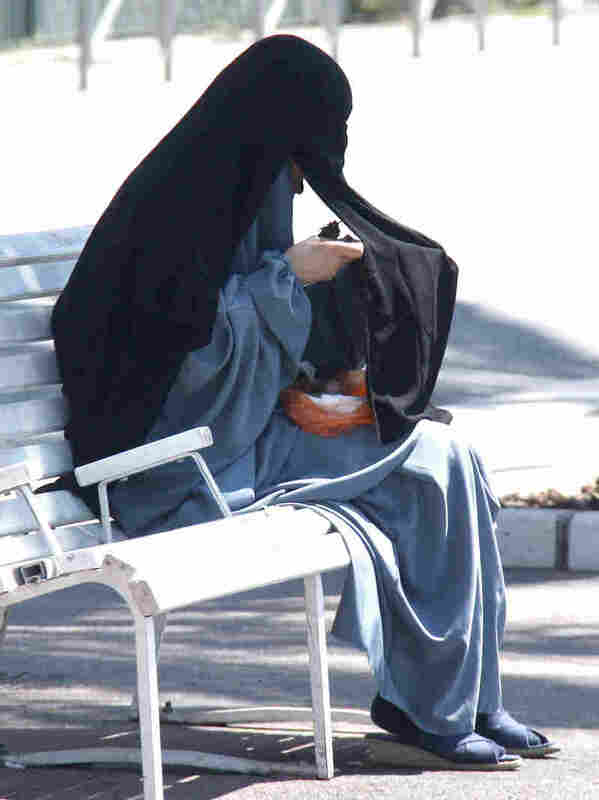 The European Court of Human Rights on Tuesday upheld a French law that bans face-concealing veils in public places. The European Court of Human Rights has upheld France's ban on face-covering veils, in a closely watched case that was brought by a Muslim woman who said the law violated her freedom of religion. The French-born woman, who is in her mid-20s, was not named. She said she wore the burqa and niqab in accordance with her faith and convictions. And, she said, she was not pressured by her family to dress in this way. The woman said that the French ban on the veils was discriminatory, and violated her privacy and freedom of religion and expression. She lodged her complaint with the Strasbourg, France-based court in 2011, soon after the French law went into effect. But on Tuesday the court ruled that France's ban was legitimate because it was "proportionate to the aim pursued, namely the preservation of the conditions of 'living together' " of all French citizens. The French law is controversial (partly because the country has Europe's largest Muslim population), and Tuesday's decision is likely to be no less so. As Eleanor Beardsley reported on All Things Considered last year, the law has sparked protests and violence. Under the law, women wearing the face-covering veil can be fined up to 150 euros (about $200) and/or be made to attend a class on citizenship. Critics say the ban targets Muslims and Islam.